Looking for a cooking idea for tonight for your little children? 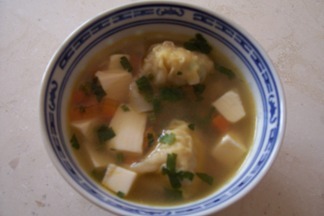 Try this Asian Chicken Soup Recipe; I think they would like it. It has a soft taste that makes it easy for your children to eat it. And it’s not difficult to make and you’re only need 30 minutes to prepare it. Is that not the most essential aspect that you need to cook after your working day? You need something healthy and nutritious but it has to be quick and easy. Trust me; this is the easiest oriental recipe that you can make. Choose free range chicken to make the chicken broth. This kind of chicken is more delicious and tasteful, but above of all this advantage, free range chickens are healthier and low fat. You don’t have to use all the chicken, just use a few parts, like the chicken wings, you don’t need the chicken meat to make the soup, and only the bone would be enough. So don’t wait, just start it. In the matter of short time you’re table will be ready with this delicious chicken soup recipe. Add the chopped spring onions and celery. Remove. Looking for healthier recipe, or even cook with raw ingredients? Maybe you could try to look these fabulous recipes about raw food. And you will get to know better that raw food is not just vegetable and fruit salad but much more than that.